Born in Hungary, Gogolak moved to the North Country when he was teenager. He grew up playing soccer, but when he found that Ogdensburg Free Academy had no soccer team for boys, he turned to football and the rest is history. Gogolak was a pioneer as a place kicker, staring to kick "soccer style". He went on the kick at Cornell University. He was selected by the Buffalo Bills in the 12th round of the AFL Draft. 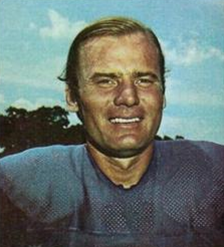 Winning 2 AFL titles with the Bills, Gogolak was an all star in 1965 as he led the AFL in field goals made. After 2 seasons with Buffalo he signed with the NY Giants of the NFL where he played 9 years. He is the Giants all time leading scorer with 646. He was honored in the Giants Ring of Honor and is an inductee of the Cornell Athletic Hall of Fame. His total career points was 863. He made 173 of 294 FGs a .588 % and had a career .972 % on extra points. After his playing career he was a longtime sales executive with a NYC printing firm, RR Donnelly. He resides in Darien, CT. The North Country Sports Hall Of Fame is proud to welcome Pete as part of it's inaugural class.